The first film shown at Indiana University's brand-new IU Cinema this November also commemorates the first collegiate screening of a recently restored classic World War II film. More than 50 years after its initial release, David Lean's The Bridge on the River Kwai will be shown at IU Cinema in January as a 4K print, the highest possible quality available for theatrical exhibition. "Studios have been restoring prints for years, but to continue restoring classic films for theatrical presentations in the digital age is something that not every studio is doing," said Jon Vickers, director of the IU Cinema. © 1957, renewed 1985 Columbia Pictures Industries, Inc. All Rights Reserved. 'The Bridge on the River Kwai' will open the IU Cinema in January as a 4K print more than 50 years after its initial release. The film has been restored by Sony. "Not only will it look better on screen than a 35mm print, the restoration will allow audiences to have the powerful experience of seeing a classic film in a theatrical setting in the best new format available. Sony should be applauded for taking the extra step of restoring this incredible film in 4K and making it available to programmers before its Blu-ray release." The January screening of The Bridge on the River Kwai will include a presentation by Vickers and Grover Crisp, the senior vice president of asset management, film restoration and digital mastering at Sony Pictures Entertainment. Crisp is currently working on a digital restoration of the film Taxi Driver with Martin Scorsese and is considered one of the foremost experts on film restoration in the world. The Bridge on the River Kwai is Sony's second 4K restoration after Stanley Kubrick's Dr. Strangelove in 2009. While many major movie studios restore classic films for Blu-ray, said Vickers, fewer than a dozen 4K-restored films — including The Wizard of Oz and A Star is Born — have also been made available for theatrical screenings. Restoration of The Bridge on the River Kwai was completed in the middle of 2010. It will be released on Blu-ray in November with restored audio, a new, 32-page book with photos and information and a set of replica lobby cards. Sony said it continues to make improvements to the film (a distinct advantage of using digital restoration). Classic films often reveal the perceptions, societal norms and conventions of the time period in which they were created, Vickers said. Restoration of such moments in cultural history through digital restoration and archiving — before they decompose and degrade with time — is crucial to preserving these time capsules of history. 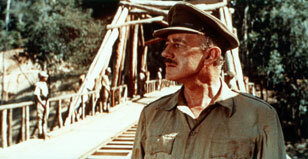 The Bridge on the River Kwai was the first major, multimillion-dollar film from English director Lean, who later became internationally renowned for his films Lawrence of Arabia (1962) and Doctor Zhivago (1965). The Bridge on the River Kwai was the highest grossing film of 1957, the same year it won seven Academy Awards, including Best Picture. Sessue Hayakawa, once a star of the silent screen, was a Best Supporting Actor nominee for his role as a Japanese colonel. The film was deemed "culturally, historically, or aesthetically significant" when it was selected for preservation in The United States Library of Congress National Film Registry in 1997. Starring Alec Guinness and William Holden, The Bridge on the River Kwai tells the poignant story of a British colonel who oversees his men's construction of a railway bridge for their captors in a Japanese Prisoner of War camp, oblivious to a plan by the allies to destroy it. The futility and heartbreak of war are seen through the experiences of protagonists from opposing cultures who share common personality traits — among them pride, dedication and an unmovable obedience to military code and rules. While the film has been restored twice before, the Sony restoration marks the first time it has been restored using the original camera negatives in a version that mirrors the height-to-width ratio of the original film. "We get to see it in the aspect ratio that David Lean intended for it to be seen," Vickers said. Restoring films in the 4K format is a multipart, painstaking process: Each of the film's negatives must be individually scanned at 4K resolution using "wet-gate" transferring, which washes the negative with liquid before passing it through a scanner to eliminate minor dust particles or film emulsion from contact cleaning. For colorized films, each of the three color registrant frames — cyan, magenta and yellow — must be digitally aligned and then adjusted, a process that can lead to "shrinkage" of the film if it isn't precisely monitored. Finally, each frame is individually cleaned to remove tears, scratches and imperfections. Hosting world premieres as well as U.S. and collegiate premieres is critical to the IU Cinema mission, Vickers said, as is hosting events that connect industry leaders to the student and community audience. Vickers said film restorations not only preserve a moment in history, they provide the films with a rebirth in theaters, reaching out to new audience, those who saw the film the first time and everyone in between. "There is a value and importance to these restorations — and it's meaningful that the film's collegiate premiere will take place at IU Cinema."